An early low fly-by. It's quick! After having so much fun with the durable flying wings, I wanted a 'real' plane made from EPP (bumper foam). It takes a heck of a beating and just bounces back. The Split was the cheapest and simplest available, and seemed light and small enough to serve my purposes. So I bought one from Perry at Aeromicro and built it "full house" (the original design has no rudder control). Other than a bit of wind weirdness and a mild tendency to tip stall, it handles pretty well. Though it's not as tough as the PCW, it still puts up with a lot of abuse and repairs are simple when needed. 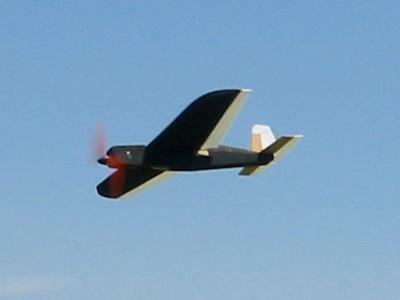 It's called the Split 280 because it's designed to fly with a direct drive 280 motor. This didn't seem all that fun to me, so I bought one of the few legendary Tweety Torque motors still available in the United States and stuck that in. Good match! Flies fast but the parsimonious Tweety can keep it in the air at full speed for 20 minutes or more. Ease off the throttle a bit and a half hour is no problem. Won't do most 3D stuff, but it has a weird and funny Lomcevak. If I have any complaint it's that the Split kept me in the air so long I got lots of practice and pushed on to 3D crashing. Consequently, it's not very challenging any more. But I do have plans to reconfigure the control surfaces and see if I can teach it some new tricks! (Later I did, only to discover the wildest flat spin I've ever seen on any plane. Enough to give it another year of flying time, but it was finally retired in honor and intact).